Revealed via Apple's Developer website using data sourced from the App Store on October 12, iOS 12 is now the dominant operating system on Apple's mobile devices introduced since September 2014. 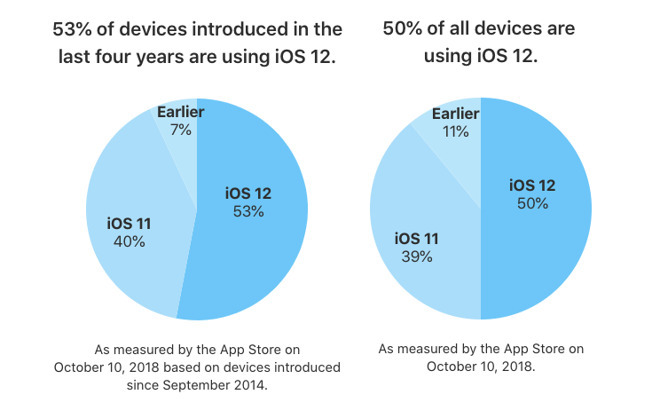 The usage of iOS 11 has dropped down to 40 percent, while earlier iOS releases make up the remaining 7 percent. In a second chart, which relates to all iOS-compatible devices that have accessed the App Store and not just those from the last four years, iOS 12 is running on approximately 50 percent of devices, with iOS 11 on 39 percent, and older releases at 11 percent combined. The data is the first from Apple itself since the release of iOS 12, which occurred on September 17. Two weeks before its release, Apple advised 85 percent of devices ran iOS 11, with iOS 10 on 10 percent, and earlier versions garnering a 5 percent share. It also seems that iOS 12 stands a good chance of outpacing its predecessor, when compared to Apple's figures released in December 2017. In November's official update, iOS 11 was on 52 percent of active devices, with the share growing to 59 percent in December. The new figures also appear to correlate with third-party analysis of device usage. Unofficial data released on October 4 by Mixpanel tracking suggested 46.95 percent of devices ran iOS 12, while 46.15 percent ran iOS 11. It is likely that the faster adoption pace of iOS 12 is down to Apple's decision to make the release focus more on maintenance and improving performance for older hardware. While previous iterations typically introduced slowdowns in older devices when performing standard functions, the latest release is in some cases making the same functions run faster than they did under the previous operating system.